The narrator has completed his task, the scenery is in place and the story is complete yet is still unfolding and as the audience observes, the happenings will become clearer. It is a drama which has taken millennia to reach this point and is continuing to intrude and encroach into our present lives. It does not tell a single story but it is a complex multi-layered tragedy. It is a tale of drama and tragedy which will may have involved shipwrecks, multiple disasters, battles on the high seas, many beyond the visible horizons, and confrontations with the immense forces of nature. No one was witness, no one knows the scale of events that unfolded but the results of tidal movements lie on this desolate storm tossed stone strewn shingle beach where the incessant surges enact there purpose. Such incidents are not confined to a specific location or time line. They exist throughout history and can be occurring at this time and may well occur in the future. These events are central to our theatre and it is on the shoulders of the audience to experience, to interpret and understand their relevance in today’s world. So let us join the assembly, not in the front row as this is already occupied. The viewer must take his place from behind others’ head and shoulders. The set is universal, a sloping wave washed beach, the vastness of an ocean and the dark foreboding night sky. The foreground is complete with eroded rounded shaped boulders many half planted within the sand, many hewn from the bed rock of a volcanic flow. They are evidence and symptomatic of tragic lives lost within the wilderness of the ocean and are now forever encapsulated within these rock formations. Countless tides have smoothed and weathered the surfaces yet still echo the human shapes of limbs, heads and torsos. They are now at rest, for the living have been drained of life’s blood. Red remnants remain, streaks and rivulets flow around the base of the entombed. Night has fallen, the darkening skies gather around the actors and high above the maelstrom the Moon, tinged with red is reclaiming her lone wandering orbit. The Sun has fallen below the horizon although vestiges of its colour remain. The spume tipped waves continually encroach, always onwards towards the sloping coastline and their folding, curling tops are kissed by the light of the lone meandering Moon. Here is a never ending conflict, an endless struggle of light against dark. The ethereal light at this time offers a range of subtlety, of beauty and trickery. 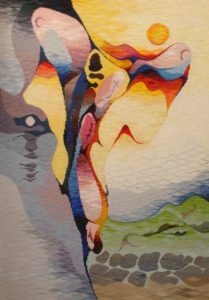 It creates a mysterious enigmatic interplay with the viewer. The radiant light from the decaying Sun is combining with the light from with our eye to create the vision of ghostlike human appearances. A time of the rising of the soul and the leaving of the physical body. It is the epitome of the spirit and the souls of lost lives who will forever exist in the atmosphere of the universe. Now as the curtain falls that which was visible in our darkened scene will presently become lost during the arrival of tomorrows daylight. Who will recall the events, who will remember those lost, who is even aware of the many dramatic tragedies, the misadventures which unfolded here and in so many other locations. Written during and after the completion of the Woven Tapestry. With the silence deafening, the somnambulist heat shimmering in the late morning light and the lonesomeness playing on my mind I was in a special place. The primordial landscape was drained of colour, only light ochres, fawns and soft browns while above the sky was devoid of cloud and of the lightest azure blue. I had walked alone around across the desert sands and behind one of the many dunes which stretched to the horizon on all sides. The sand was scorching even through my boots and I could feel the grains of sand as they were whipped up from the floor and attacked my uncovered legs. Why had I come to this blistering, searing site of desolation and isolation? Yet here in the Namibian desert, as in the high places of the Himalayas, the physical natural world meets the spiritual world. Given the rare opportunity of being alone, without companionship and out of sight of any semblance of civilisation is something I would always take, even if it was only for a short time. The sun was strong and during the morning since it arose above the horizon it had warmed the earth. Nothing stirred, all life had disappeared into the sands. No birds flew. No sounds or songs of life. This duvet of heat encompassed all. I stood still, looked, listened and as I slowly turned through a full circle I found that I had a companion. I was stationary and with the heat from the overhead sun on my back I looked down and noticed there was a truncated shadow emanating from my feet and it too was motionless. Somehow I felt more attached to the earth seeing the darkened form in front of me. I was standing vertically, the growth line, and my shadow was horizontally, the earth line. The combination of the two providing a firm foundation and a more permanent positive link with ground, and with the metaphysical and the supernatural. I was at one with my surroundings and with my innermost thoughts. Whether it be the deserts, the high mountains, the snows on the Northern fells, the volcanic beaches of an Atlantic island, the claustrophobic underground caverns of the limestone regions are locations which are special and have always attracted me. To be alone concentrates the experience, it highlights the intensity of the occasion and adds beauty to life. Looking down at my own shadow gave me the feeling of a more robust foundation with the earth. I was rooted, welded to that spot and which occupied all of the three dimensional volume of my standing form. Was I really alone? Was my shadow part of me? I was experiencing a feeling was of positivity and greater permanence. But what is a shadow? The brighter and stronger the light the deeper the shadow, it is created with degrees of gloom, of shade and adumbration, of dimness and partial obscurity. It might be pronounced or hardly visible, does it need to be visually discernible? Are we not always creating a shadow and retaining a more positive relationship with the earth and our existence? It was in 1999 that I found myself walking along a desolate volcanic beach, eroded over centuries and containing rounded forms covered by layers of lava. An Atlantic island forged from the activity of Vulcan’s forge forcing the earth’s magma up through the seas. The south westerly wind was blowing strong, the white topped waves breaking, rushing and forcing their way into and around the rock structures. The ocean seemed to be clutching in a vain attempt to reclaim the detritus, the flotsam which was on the beaches. The sound was deafening and the air was filled with the spume coming off the crests of the breakers. The air was filled with the smell of the sea, the taste of salt added to the scene. But it was the rounded shapes which attracted my thoughts. They had the appearance and the configuration of human bodies, of limbs and torsos beneath a blanket of a smooth lava blanket. They reminded me of the rounded bronze forms of the sculptures of Henry Moore. I could imagine that at some long lost time this harsh coastal strip had been the location of shipwrecks and the resultant loss of life had been thrown upon these beaches. Long lost souls, perished here and now locked into position for eons to come. It is a desolate place, low to the ocean and constantly being whipped by the winds and tides. “The Beach of Lost Souls” a prose poem I wrote between 1999 and 2009 expresses the intensity, the unnerving and disconcerting feelings when witnessing this extraordinary lonely expanse between the land, the desert and the ocean. While wandering along and making frequent stops to photograph I suddenly stopped at a particular formation. Standing there with a bright sun and a vast sky, the wind was howling, the white crested waves gnawing at the sloping beach. I looked down. In front of me was a humanlike formation, created by the eroded layers of lava and shadows thrown by the strong sun. It was not just a shadow although it emanated from my feet. Was I looking at a manifestation of man? Was I perceiving more than that was there? Was I seeing myself? Was it my mind creating more than I was observing or recognizing? What was I attempting to comprehend? The image was stark and somewhat daunting. Its pose was reminiscent of a dancer, a toreador, a winged creature and had an uncomfortable feeling of a crucifixion. Its presence although horizontal was so strong that it was some time before I realised it was not vertical. Being in almost monochromatic greys and whites gave me much scope to concentrate on the form and I was able to develop a colour palette for a chosen theme or concept. Subsequent drawings and water colour paintings explored and exploited this abstract form and eventually these were taken into a woven tapestry. I continued with my lonely meanderings and taking photographs for some time. This whole landscape held a fascination for me. I sought explanations but found only more questions. 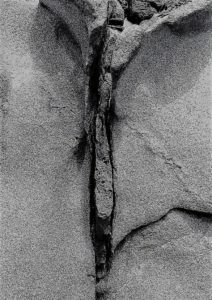 I had made a direct and firm connection with this formation. It was to feature in many subsequent drawings and paintings which culminated in my tapestry “The Struggle of Life”. This piece woven in 2007 hangs in the church in Stanhope, Weardale, Co Durham and commemorates not only my parents but all who live, work and play amid the beauty and harshness of the Northern Pennines. Such was the impact of this primary experience on my thinking that I simply had to return. I could not forget, indeed I did not wish to confine the emotions and sensations to the past. The image made a very long shadow for me and I felt that I was partially responsible. 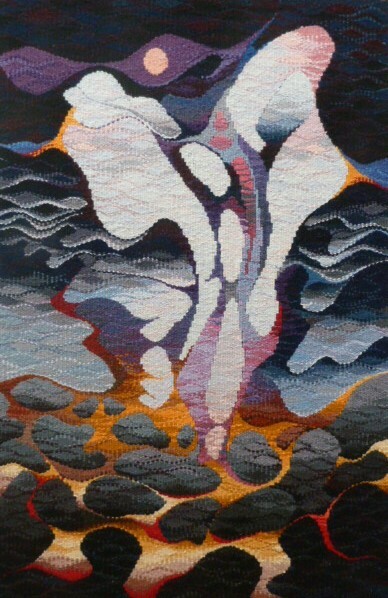 “The Struggle of Life” Stanhope Tapestry Woven 2007. Ten years on, in 2008, we returned to the same wind swept beach and searched for that formation that he become etched on my mind and influenced my thinking. While the development of the area had continued the low sloping beach had not been affected. The day was bright, warm and the surf seemed more friendly and those “human forms” still resting beneath their lava blanket. Despite the size of the area I was able to find the exact formation and amazed to see how little it had changed. 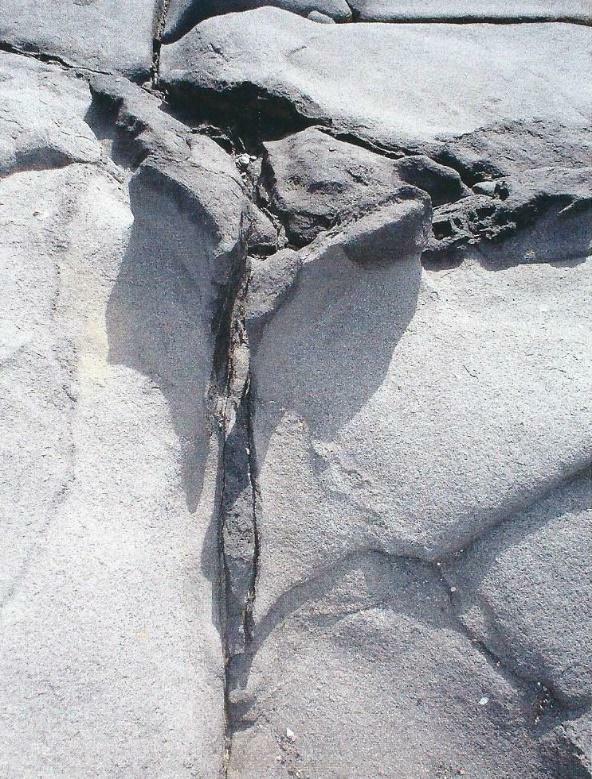 Many ebb and flood tides, storms and gales over the past decade tried hard but the hardness and durability of the lava ensured its survival. The year 2002 saw me involved with the dramatic scenery of Hadrian’s Wall on the edge of the Whin Sill, that area of crags and cliffs, and undulating landscape. This feature defined the boundaries of the Roman Empire and to act as a defensive line from the Solway to the Tyne. The Whin Sill rise from the South to the North in a successive waves and the drops suddenly in a long escarpment to the rolling plains of the North. It holds a fascinating appearance, likened to gigantic waves throwing themselves on to a shelving shore. Along the bluffs, ridges and crags to the distant skyline, the crests of the scarp the Wall is seen to climb majestically yet calmly. Coupled with the physical geological landscape and the striking cloud formations created by the prevailing winds from the south west we find a “tingle zone”. This is where the physical world and spiritual worlds meet. Standing on the wall looking east along “Cuddy’s Crag” I could feel the memories of countless people, a tangible experience and along with my shadow we were part of a scene which has not changed for centuries. I have felt the same sensations in places where man has had a continual presence over eons of time. Particularly in the great Gothic Cathedrals, especially Chartres, Durham and many other religious sites, in the caves of France and Northern Spain where the paintings elaborate the link between the physical and spiritual world. Their “shadows” lingered long in the mind and generated many emotions and feelings and provided much impetus to my visual work. 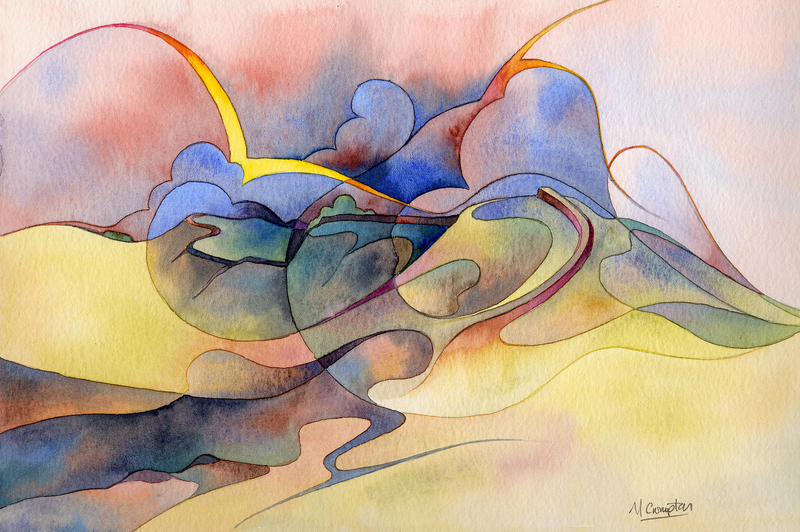 The landscape and the emotions generated are self-evident to see and experience. What was more challenging was how to incorporate man, his spirit, endeavours and his will and determination. His “shadows” of a long ago presence are tangible and still remain in the mind and play on our multifaceted feelings. My research introduced me the poetry of E. A. Houseman and his poem “On Wenlock Edge” from “A Shropshire Lad”: XXXI. 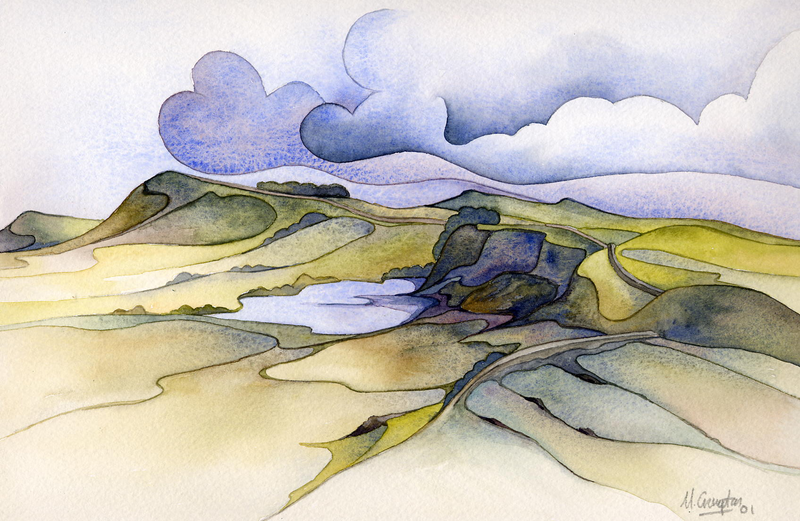 The above water colour paintings combine the landscape imagery of the Wall situated on the escarpment and the shadow of man has intruded. Those who built, manned and lived along the wall although long departed they have left a powerful legacy. Their shadows have intruded, encroached and I can only quote line 16 from “On Wenlock Edge” to see a final outcome. My process is totally absorbing, of ideas and concepts yet technical aspects play a secondary role. My goal is there to be achieved….but it is never reached. The themes amplified by shape, form and line coupled with colour and tone create a series of pathways. With the direction and destination unknown the journey can never be concluded.